Om artasaranyaya namaha, Salutations to the Sun who gives refuge from afflictions and disease. First house is house of the body, its constitution, robustness, and general overall health. Looking to Climate Change in NOW – the open moment – we look to what the planets have to tell us about climate change and the state of the Earth, our Mother. Om puskaraksaya namaha, Salutations to the Sun who has eyes like the blue lotus. Om Ijyaya Namaha, Salutations to the One who is the object of all worship; who is revered, honoured and the receiver of all sacrifices and offerings. Om Visvarupaya Namaha, Salutations to the all-inclusive all-pervading cosmic form of the Lord, self-manifested as the universe. The Sun is that which is seen, that which is known as the shape and form of the manifest Universe. Om Anantaya Namaha, Salutations to the One who is immortal and has no end. The outer Sun is the significator of the inner sun within the human. The inner sun also shares this quality of anantha, for man is not new; man is one who has been born in order that he or she not be born again! True humanness seeks sat, chit, ananda: being, awareness and eternal bliss. Om Adibhutaya Namaha, Salutations to the One who has taken form first. The Sun, self-effulgent, radiating light it partakes from the Central Sun of all the Universes, lokas. The Sun is a fragment of the Central Sun of all Universes, and thus, radiates the life-force of all to all, without fear or favour. The Vedas are the first that arise and the cause of light being perceived. Om Saranaya Namaha, Salutations to the Refuge. The Sun, self-effulgent, radiating light and heat along a perennial, eternal path of righteousness, reflecting the eternal order of the Universe. The Sun is a fragment of the Central Sun of all Universes, and thus, radiates the life-force of all to all, without fear or favour. The Sun God grants refuge to all who seek refuge. Makara Sankranti is celebration of the entry of the Sun into Capricorn. 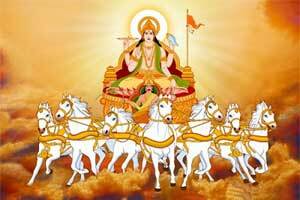 In India, it is the entry of the Sun, (Surya) into zodicac sign called Makara, hence, it is called Makara Sankranti. This festival marks the end of Winter and the beginning of Spring. It is a day of celebration, the commencement of harvest, and special foods are prepared (pongal) and gifts are exchanged - sometimes, the gifting of idols to family and friends. It is important to feed people on this day, as the gifts of the Earth belong to all. Looking deeper into the divisional charts of vedic astrology on this occasion suggests a spiritual benefice is available to seekers.